A 1D-CFD simulation or system level CFD focuses on the entire system rather than on the details of the flow inside a specific component of that system. In a 1D-CFD simulation each system component is modeled, and their combined effect is modeled in the systems, uing empirical laws or performance maps. In the real world, every system, from a small air conditioning system to a large chemical cooling system with thousands of components (pipes, bends, valves ...), must satisfy prescribed safety and high performance requirements. In most cases it is virtually impossible to test the system before it is actually built. Notwithstanding this, a faulty sizing of the system or a single badly designed component can jeopardize the entire project and for these reasons numerical studies in the pre-design phase of the project are mandatory to satisfy all requirements. 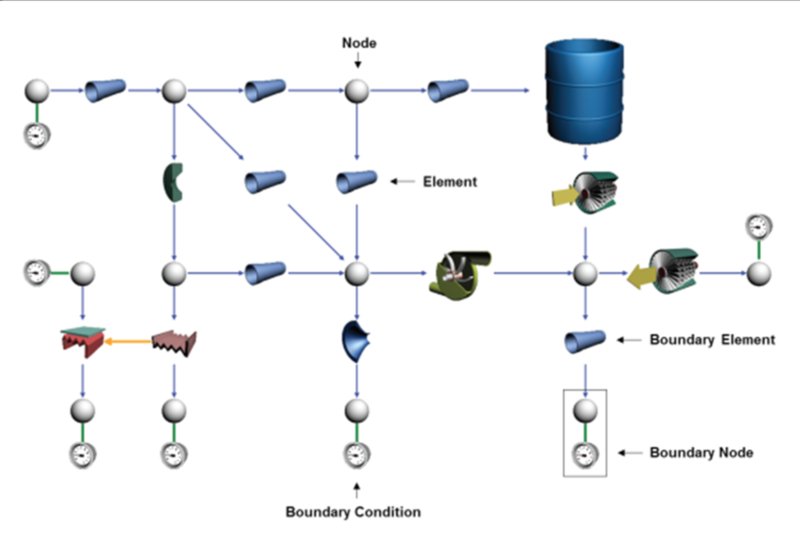 In 1D-CFD simulations a physical system is modeled using a network of different components each of which models a specific component of the system such as a pump, valve, pipe or bend. Each component is modeled on the basis of empirical formulae describing the relationship between flow and pressure drops and between flow and heat transfer (if the model accounts for such a phenomenon). Each component is therefore characterized by geometrical and performance data. For these reasons the 1D-CFD software package used must include a comprehensive library of pre-defined components, performance data and materials used for creating and characterizing the network. Additionally thermal phenomena can be considered in order to study heat transfer processes inside the system or between the system and the external environment. 1D-CFD and 3D-CFD systems are not used in a mutually exclusive manner. On the contrary they should be considered as complementary systems where particular components in the 1D network can be characterized using data coming from 3D-CFD simulations, and 1D-CFD simulations can be used to identify boundary conditions for 3D-CFD simulations. Why are System Level 1D-CFD simulations so important? Industrial systems, from the smallest to the largest, must operate in many different scenarios and under different operational and often extreme conditions. Moreover, they can undergo operational and emergency maneuvers such as the pump tripping or valve movements that may cause severe pressure surges (water hammer effect) that may damage the system and cause serious safety issues. Since it is not possible to test most systems before they are installed, it is of paramount importance that the most reliable design be created in the design phase of the project. Since simulations at a system level take from just a few seconds to a few hours to run, it is possible to test hundreds or even thousands of different configurations, different operational conditions and different maneuvers during the pre-design and design phases. The results provide engineers with a deep understanding of the system’s performances and of the system’s sensitivity to different conditions.